Decorative Life: Many weeks assuming reasonable cultural conditions. Do better in the landscape if grown in mixes containing both a wetting agent and hydrogel. Physically brushing daily can reduce plant height in a similar fashion as applying growth retardants but without chemicals. A very common member of the Solanaceae (nightshade family). Relatives include tobacco, eggplant, tomato and potato. Plant is classed as a dicotyledon, leaves not parallel veined. Flowers are single or double , funnel-shaped often with wavy margins up to 4 inches across, petals very thin. Flower clusters bloom singly at ends of trailing tender stems with hairy leaves. Plugs can be stored for up to six weeks at 35-50F if provided as little as 5 ft-c of light during storage. Petunia: from a South American aboriginal name. This species represents a complex group of hybrids. The American Academy of Allergy, Asthma and Immunology list this species as an allergy-safe pollen producing plant. This family has many poisonous members including the common weed, deadly nightshade, and the green skin of potatoes. On the other hand, it is a source of many commercial foods including potato, tomato, pepper and eggplant. Tobacco also is a member. Genetically engineered petunia plants to make their flowers insensitive to ethylene do not grow and develop the same, as plants not genetically altered. 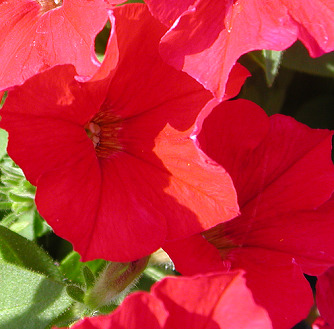 In another series of tests, petunia flowers also engineered to be ethylene insensitive did not open properly. Some favorite cultivars and their respective flower colors include ‘Bravo’, ‘Hurrah’ and ‘Fantasy’, all having blue, red, white and other colors, ‘Doubloom Pink’ and ‘Cascadia Red’ (salmon red). The Supercascade, Celebrity and Madness series are also very popular, each with a wide range of flower colors. Doyle et al. (1994) demonstrated that consumers associated blue petunia flowers most with “congratulations” as a communications symbol and preferred blue to red petunia flowers by 11 to 1. Benson (1995) showed that growing media drenched with aluminum sulfate solutions could help control the damping-off fungus Phytophthora without damaging plants as long as lime levels are adequate.